A board game about the GREAT city of Topeka! 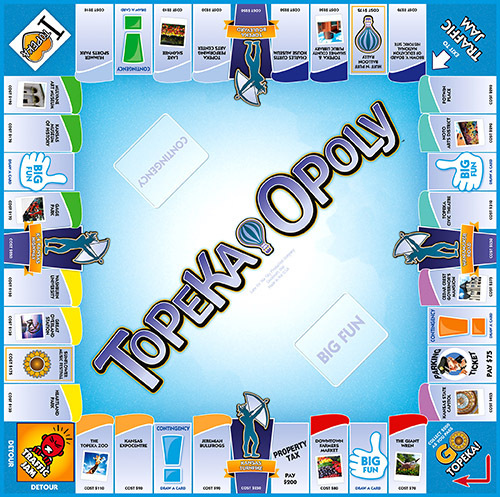 We chose some favorite landmarks and traditions, mixed in some hot air balloons, sunflowers, a great big motorsports facility, and some BIG FUN... and voilà (vwä lä)-behold; Topeka-OPOLY! Grab Some Friends and Gather 'Round! Here's a quick idea of how to play! Buy property, collect City Blocks and trade in for a Key to the City. It sounds easy enough - but add in a traffic jam, property taxes, parking tickets and the IRS and it becomes a little more difficult... and a lot more FUN! Get YOUR Game On, Topeka! It's Your Roll!